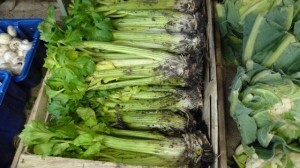 Celery is one of those vegetables we are used to being available all year round. We enjoy the crunchy stalks as a snack with our cheese, and we need the flavour as part of the trio of chopped onion, carrot and celery which begins so many delicious soups and stews, such as a proper bolognese sauce. From about now until Christmas we can and should enjoy a very special and regional treat, Fenland celery. Excitingly, this is the first English vegetable to earn Protected Geographical Indication (PGI) status from the European Commission. To achieve this status, an entire product must be traditionally and at least partially produced within a specific region to acquire qualities unique to that region. Fenland Celery has been grown in the black peaty soil of the fenland flatlands since Victorian times, using methods developed by Victorian market gardeners. The heads of celery are encouraged to grow on slowly into the colder weather, planted in widely spaced trenches, and ‘earthed up’ in the soft black soil. Historically this was to extend the growing season into the winter when market gardeners could expect a higher price. The effect was to produce celery with beautiful white and tender stems with very good flavour which became very popular at Christmas. Not a bit of it should be wasted and celery keeps very well in the fridge salad drawer. Use the root and outer stems chopped into your soups and casseroles. Snack on the the innermost stalks. Flavour your stocks with the leaves. There is no better accompaniment to your seasonal cheeseboard, with each stem sliced into sticks lengthways and stood in a jug of cold water to be passed round along with the Stilton, nuts and port. Very simple to make, and a good accompaniment to roast chicken or game birds. Just wash and trim a head of celery stalks to even lengths of about 8cm, place in a baking dish, dot with butter and season. Pour over a teacup-ful of stock, cover with foil or a lid and bake at 180°C for 30 – 45 minutes or until tender. (Or cook in a shallow but solid pan with a lid on the hob, bring up to the boil first, then reduce heat to simmer). This can be smartened up to become a gratin: remove the celery once tender, reduce the cooking juices by about half to intensify the flavour, return the celery to the juices, add a sprinkling of breadcrumbs and grated parmesan and brown under the grill. For a richer version, a spoonful or two of cream or creme fraiche can be added to the juices. Alternative more substantial version: begin with browning two or three chopped rashers of bacon, then soften a chopped onion and finely chopped carrot with the bacon before adding the celery. Traditionally the pig would be killed about now, as late autumn turns to winter, after a good season of foraging and to be cured in time for Christmas. It’s a very good time of year for a few meals of delicious fresh pork. Ours is all outdoor reared from Tim Allen of Morley Farm, South Creake. Pork chops are prime tender meat, but are not all that easy to get right: they need to be cooked through but end up still juicy, not dry. It helps to have really good quality pork: not too lean, with a good edge of fat. By browning them on the hob first, and finishing them in the oven, you should be able to get a nice brown crustiness on the fat with juiciness in the meat, and at the same time give the meat time to absorb the flavours of whatever you put with it. This is a version of the method in Hugh Fearnley-Whittingstall’s Meat Book. 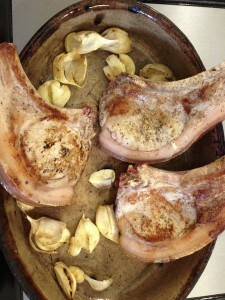 Brown your pork chops in a hot frying pan in a little olive oil. Remove to an oven dish or roasting tin in which you position the chops so that the fatty side is uppermost and if possible held up on the edge of the dish. Separate a head of garlic into cloves, lightly flatten with the side of a knife (don’t skin them), and brown in the frying pan before adding to the chops. 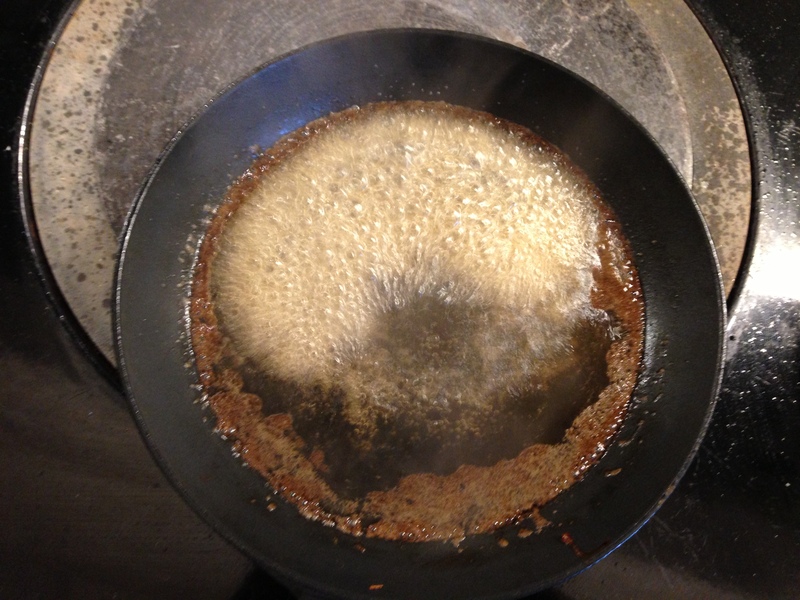 Deglaze your frying pan with a cupful of good dry cider (Whin Hill cider is delicious for this, and to drink with your pork supper) and pour over the chops. Tear in a few sage leaves or sprigs of thyme. Roast the chops in a very hot oven (200°C or more) for 15-20 minutes, turning and basting them half way through. They are ready when the juices are clear, but don’t poke them about too much or you’ll lose the precious juices from the meat. Good with plain boiled or steamed potatoes, shredded cabbage, and some lightly fried apple slices, or just add quartered cored apples to the pan when you put the chops in to roast, turning them over gently in the pork juices at half time. A ripe pear is a wonderful thing, but they can turn quickly from too hard to oversoft. Although they are in season, it is very difficult to keep them in stock in perfect ready to eat condition, so buy unripe and let them ripen in the fruit bowl. Those less than ripe pears can be slowly and classically poached with cider or red wine, sugar and spices, or added to a tart such as our winter almond frangipanis available from the deli – although in both cases they are nicer when cooked from almost ripe, rather than rock hard. Norfolk Riddle Head Chef Hervé regularly has the classic Poire Belle Helene on his menu: this combination of poached pear, scoop of good vanilla ice cream and swirl of dark chocolate sauce may be very familiar, but it is no less delicious. Created by Escoffier in the 1860s, the dish was named after an operetta by Offenbach and was originally garnished with crystallised violets! 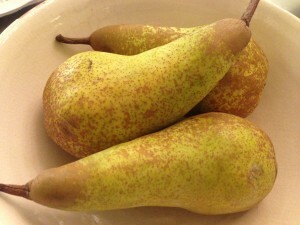 Pears are delicious additions to savoury dishes: great with pork or lamb (try with the pork chops, above). Chris in the Walsingham shop kitchen makes a delicious pea and pear soup, and a pear chutney. Ripe pears marry brilliantly with blue cheeses. Here’s an elegant salad starter or cheese course for a supper party: for each plate, a little heap of rocket leaves, two or three ripe pear slices, two or three small slices of Mrs Temple’s Binham blue cheese, a sprinkling of lightly toasted walnuts. For a dressing, whisk together lemon juice, balsamic vinegar and extra virgin olive oil with seasoning to taste (remembering the cheese is quite salty already).